Buy Any 3 Perennial Plants or Bulbs & Save 20%. Cannot be applied to previous orders. Limited time only. While supplies last. Shade-loving trio of unique textures. Ultimate foliage textures abound in this special collection of shade garden favorites. You get one plant each of: Ostrich Fern, one of the all time best with tall and feathery plumes; Japanese Painted Fern, beautiful fronds with wine-red ribs; and Autumn Fern, golden green with a copper contrast. Zone This refers to the USDA hardiness zone assigned to each part of the country, based on the minimum winter temperature that a region typically experiences. Hardiness zone ranges are provided for all perennial plants and you should always choose plants that fall within your range. Resistant To Adverse garden conditions, such as heat or frost, deer or rabbits, that this product can tolerate well. Ornamental Use Ways in which the product may be used in the garden for ornamental effect. Perennials return year after year blooming on their own. 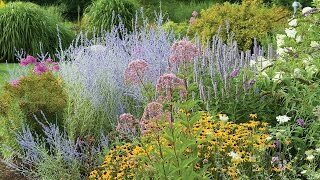 Watch this introduction and discover how easy and rewarding growing perennials can be. Take a garden tour and see favorite perennial plants in a garden setting. 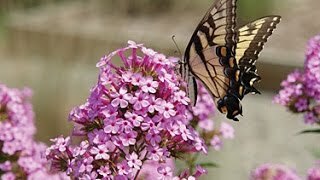 In this video- Rudbeckia (Black Eyed Susan), Perennial Garden Phlox, Hibiscus and Silphium. Choose a location in full to part shade, with moist, slightly acidic soil rich in organic matter. Prepare the bed by turning the soil under to a depth of 6-12 inches removing any debris, and lightly raking as level as possible. The addition of organic matter (leaf mold, compost, well-rotted manure) benefits all gardens and is essential in recently constructed neighborhoods. Plant on a cloudy day or in late afternoon to reduce transplant shock. Dig a hole for each plant large enough to amply accommodate the root ball. Unpot the plant and gently loosen the root ball with your hands to encourage good root growth. Place the top of the root ball even with the level of the surrounding soil. Fill with soil to the top of the root ball. Press soil down firmly with your hand. Use the plant tag as a location marker. Thoroughly water and apply a light mulch layer on top of the soil (1-2 inches) to conserve water and reduce weeds. Keep weeds under control during the fern growing season. Weeds compete with fern plants for water, space and nutrients, so control them by either cultivating often or use a mulch to prevent their germination. Mulches can be used to help retain moisture in soil and maintain even soil temperatures. For perennials, an organic mulch of aged bark or shredded leaves lends a natural look to the bed and will improve the soil as it breaks down in time. Always keep mulches off a plant’s stems to prevent possible rot. Careful watering is essential in getting fern perennials off to a good start. Water thoroughly at least once a week to help new roots grow down deeply. Soil should be damp at about 1 inch below the soil surface. You can check this by sticking your finger in the soil. Water early in the morning to give all leaves enough time to dry. One inch of rain or watering per week is recommended for most perennial plants. You can check to see if you need to add water by using a rain gauge. Until the fern plants become established, some protection from extreme winds and direct, hot sunlight may be necessary. Good air movement is also important. After new growth appears, a light fertilizer may be applied. Keep granular fertilizers away from the plant crown and foliage to avoid burn injury. Use low rates of a slow release fertilizer, as higher rates may encourage root rots. Ferns are low-maintenance plants, but they need a consistently moist soil in order to thrive, but do not leave ferns in standing water. You can propagate ferns by division in fall or spring. Fern foliage is great for greenery in flower arrangements. Ferns are perfect for shade gardens and woodland areas. They combine well with hostas and other perennials that do well in shade. Creeping ferns make great groundcovers. Fern Collection is rated 3.6 out of 5 by 5. Rated 1 out of 5 by Fernijen from If I could give Burpee a Zero star I would I received my order of the Fern Collection yesterday. I opened the package and found 3 fried crispy critters. I thought maybe I could mist them back to life but it's looking like a lost cause. Super sad and disappointed. Total waste of money as far as I'm concerned. Rated 5 out of 5 by SueG from Love my fern collection I purchased the fern collection and am quite happy so far. They've taken hold and are growing nicely. I can't wait to see how they fill out in the next few years. Rated 5 out of 5 by plant md from great ferns I had these planted in the shaded area of my garden in the spring and now threy are growing nicely. can't wait till fall foliage. Rated 2 out of 5 by Taunyia from Not impressed The Japanese fern in this collection is awesome. The other two types are terrible. When I first planted them two of them died within a week and you did give me credit for them.They have been planted for a few months now and the only species that is thriving is the Japanese Fern. All of the others are either dead or close to it. They are all planted in the same soil and were watered the same. Be assured that when I buy more ferns to replace the ones that have died or are dying I will not choose the fern collection but will buy just the Japanese fern. I would not recommend the collection. Rated 5 out of 5 by MaggieGardener from Beautiful, healthy plants These ferns look great! It took me about a week to get around to planting but they transplanted very well and I am quite pleased with my purchase. I have ordered plants online from other companies without much satisfaction so was hesitant to order from Burpee this Spring. However, I am sold on Burpee products and service.